I have a new friend who is on a strict gluten-free diet, which I have chosen to look at as a fresh cooking challenge. As with all new adventures, there have been hits and misses; I am still trying to work through my emotions about matzo balls made with almond flour. But one dessert I made for G. has become a new favorite in my house, and a go-to cookie for all occasions, gluten-free guests or not. These are tremendously fast -- just the thing for a last minute dinner party -- totally delicious and the only person who won’t like them is the chocolate hater, who I am sure is working that issue out with the help of friends and family. This is my adaptation of the Mexican chocolate cookie, which generally involves chili powder and crushed nuts. I have made the cookie in its original form, which I love, but decided when I was making it for a party that I would make a cookie that was not only gluten-free, but an option for those with nut allergies (or aversions) and without the spice that some kids might dislike. Often there is an inverse relationship between the amount of effort expended to make food inoffensive and the pleasure taken from eating it. Not here. 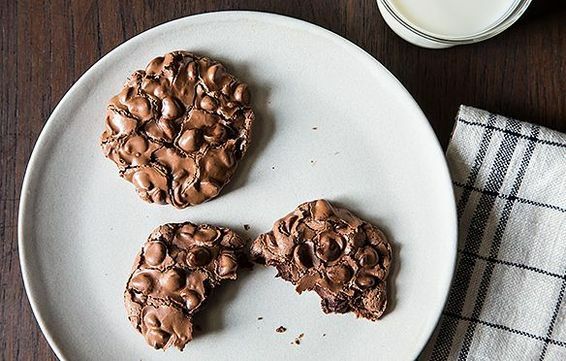 This cookie is so pleasurably rich in chocolate, and offers such a delightfully surprising texture, that most people race toward them like deer to a salt lick, until they are all gone and your guests begin staring at you with mild accusation, as if you purposely didn’t make enough. The key here is good chocolate -- the powder can be natural or Dutch processed -- and not overmixing. The batter will look a little odd once you get the egg whites in there, as if there is not enough binding agent. Don’t worry about this. Just plop these suckers out on a parchment-lined baking sheet and tuck them into the oven. Once they start cracking, they are done. Take them out and let them cool a while on the pan or they will fall apart as you attempt to remove them. Once they are cooler, remove them to the rack. Then stand back. They won’t be there long. I have made these twice: once following the recipe to the letter which produced, as promised, amazingly delicious and intensely chocolately cookies. I made them a second time, with cayenne, pecans and esspresso powder and the verdict was even more amazingly delicious! Either way, I will be making these again soon: they are so simple to put together and the results are marvelous. I have made these twice; once following the recipe down to the letter...they were perfect and I was amazed at how something so simple could be so wonderful. The second time I made them, I added toasted walnuts, a pinch of cayenne and some esspresso powder and honestly, I liked them even more because they tasted more complex...either way the verdict is awesome! I made these a few days ago, and they hold up well in the cookie jar! Also, I had only 1 cup of chocolate chips, and they were still yummy. Any chance there could be a vegan version of this recipe, or have you tried these with egg substitutes? These chocolate cookies looked divine. I want to devour them right now. Even if I'm not on a GF health watch, I will make a batch of these! Thanks for sharing a great recipe! My favorite New Yorker cartoon ever is "The Last Thanksgiving" with the table surrounded by people on different diet restrictions. That said, my two dear sons each represent a food no-no--- Son #1 (22 years old) is what I call "nutaphobic" and what he calls allergic to nuts. (Somehow peanut butter is ok but peanuts are not, and we all know peanuts are legumes.) Son #2 (17 years old) seems to be lactose intolerant, including all cheeses and butter. Arrrgh! Thanks for the recipe. They'd better like it! you will like it too i hope! The peanut butter thing actually makes sense. The heating and grinding of peanuts greatly reduce a bad compound within peanuts. I think orange rind would be good, just different. This gf recipe looks terrific. Please send along the additions to make it nutty and spicy. Luckily, those are two food items I can still have in my diet, and I love them both. I'd make the recipe both ways and add them to my gf repertoire. Fabulous! And if intending to be nut-free, just make sure you carefully review the chocolate you use -- I've only found one brand that isn't almost certainly cross-contaminated. This is a HUGE issue for us as our family includes a nut allergy of the "carry an epi pen at all times/put you in the hospital" variety. The tiniest trace of nut (as can occur in any facility that also processes nuts) will trigger this allergy. thank you for trying them! Heya! I'm from New Zealand, and I'm just wondering what exactly "powdered sugar" is? We don't call any sugar "powdered sugar" down here... Is it... Castor sugar, normal white sugar, icing sugar....?? Oh, my, this recipe is fabulous. I have a friend who is strictly kosher and stricly gluten free, and her husband is allergic to nuts. Not only is this good for both of their diets, it's pareve! Thanks! These look like they follow the same principles as the chocolate puddle cookies by Heidi Swanson (http://www.101cookbooks.com/archives/chocolate-puddle-cookies-recipe.html), which are popular in my family due to the awesome presence of walnuts. Yes this cookie tends to be made with nuts. That is one central difference with this recipe. oh, yum. i have 3 egg whites in the freezer with these babies' name on them. wait, you can freeze egg whites??? yes--I'll let you know how they turn out. You can totally freeze egg whites! These look great - not to be obnoxious, but any recommendations on what to sub out for the egg whites? My beloved dad is gluten-free and 89 percent vegan - ok with butter if needed (not psyched about it) but totally ovo-averse. Any suggestions welcome :-) but not expected. Just in case! i confess i am at a loss but some of the vegans in this community will probably have ideas. These sound fantastic, and I love their crackly slightly glossy surface. Definitely one of its finer features yes!